Even though the kittens have full-run of the house, there are times when I just don't want them under foot. I use baby gates to section off areas and give them some space, but keep them contained and out of my way. This works for awhile, but eventually they do realize they can climb the gates. They haven't figured out how to get back down yet, kittens rarely have an exit strategy, so they'll linger on top until they are rescued. Ahem. "Exsqueeze me. Could I get a little halp over here, pweese?" Go figure, kittens and Dubya have something in common! He's already getting so big! Louis is just priceless. He is just the cutest and silliest little button evar. I luffs him. I feel just the same way! It's his silly little feets. Or maybe his stripey tail. Or is it that precious little face? Louis is just full of kitten goodness. Whoever adopts him is a lucky, lucky person! And he does look like he is filling out nicely! So good to see. 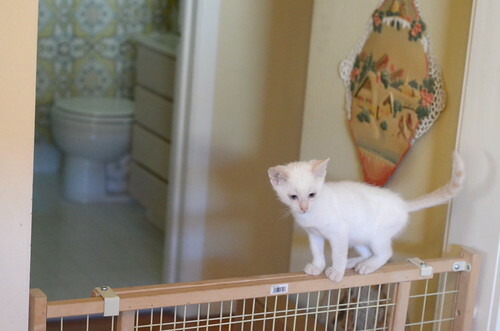 Gordon Draper Saddest Kitten on Earth, is still, to this day, my absolute favorite Itty Bitty Kitty photo ever. "Kittens rarely have an exit strategy" -- hahahahaha! So perfect an explanation for all the mischief they get into! And could Louis be more adorable stuck on top of that gate or what? Isn't that just the best line ever? Oops - sorry about the double posting. Google knew I was excited! Louie has a ginger tail?? Rosemary, he'll have ginger ears and legs too by the time he grows up. The color deepens as Siamese mature. 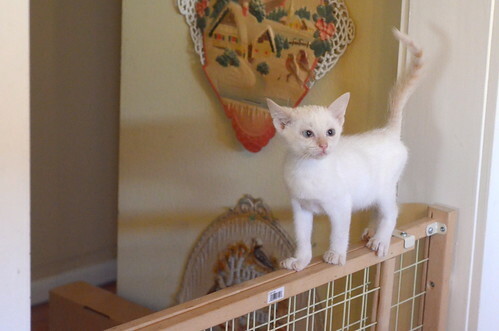 Louie is what's called a Flame Point, like my adored Potter who looked exactly like this when he was a baby. I want to hike across the country and have Louie for my own! I have a foster litter with 3 tabbies and 2 siamese points (from a tortie mother... go figure). The female is seal point and her coloring is developing much quicker than her brother's. 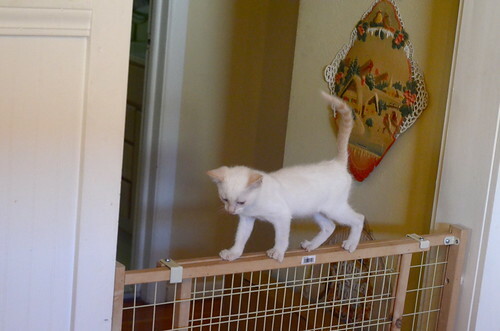 He is a flame point, but so far just the faintest orange. Her fur is creamier, where his is bright white too. Louie is so cute. I love siamese and he's my favorite out of this fabulous litter. Today, the gate, tomorrow, tightrope walking across Niagara Falls! I can practically see the question mark floating over his head. Also, THE FEETS! If he grows into those feets, nobody will be able to fence him in! Sweet Shrimp Louie...a wonderful little fluff bucket. Let's see, I gots up here...now what? Charlene? Laurie? Craig? Anyone? helps? He is SO adorable! Is Louie as cross-eyed as he looks in the first picture? Shrimp Louie is not so shrimpy anymore! Look who is a big boy now. What a cutie, hope he keeps the blue eyes too, like many siamese do. This bunch has the legginess and triangular faces of the Siamese cats. They definitely take after Dad. I really, really hope Louie goes home with Liam. They're such an awesome pair, and Violet and Sol are a matched set! Look at that big boy! But it's true - logic is not a kitten's strong suit! Wow! This Small is looking like a little cat now! Gah! When I zoomed in, I saw that he has ginormous toes! SPLORT!